Mary I (18 February 1516 – 17 November 1558), also known as Mary Tudor, was Queen regnant of England and Ireland from 19 July 1553 until her death. She was the oldest daughter of Henry VIII, and the only child of Katherine of Aragon who grew up. 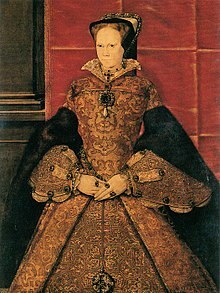 Mary succeeded her short-lived half-brother, Edward VI, to the English throne. She was the fourth crowned monarch of the Tudor dynasty. Mary is remembered for briefly re-making England a Roman Catholic country. Mary had almost 300 disagreeing religious people burned at the stake, which are recorded in John Foxe's Book of Martyrs. Due to this, many called her "Bloody Mary". When her half-sister, Elizabeth I, came to the throne after Mary's death, she made England Protestant again. After Anne Boleyn had a daughter, Henry VlII distrusted Mary and thought that her behavior came from her mother. So he purposefully separated Mary and Catherine of Aragon. He also banished them both from court and he removed Mary from the line of succession. Mary had to become one of her servants. After Anne Boleyn was killed by the King, Mary's half-sister also became a servant. A month later, Henry VIII married Jane Seymour. Queen Jane gave birth to Edward, Prince of Wales. 12 days later, Queen Jane died. If Mary did not produce a child, then Mary's half-sister, Elizabeth, was to be Queen. After Elizabeth and her heirs, would come Henry's sister Mary Tudor's side of the family. ↑ "Catholic Encyclopedia: Mary Tudor". newadvent.org. Retrieved 27 May 2010. ↑ "Letter of Princess Mary to King Henry VIII, 1536". English History. 2015-02-22. Retrieved 2018-03-13. This page was last changed on 5 April 2019, at 08:50.